Dietary sugars and in particular add sugar have been shown to promote excess adiposity, body fat, in both children and adults. This being said, no studies have examined fructose in human milk and its effects on body composition during infancy. 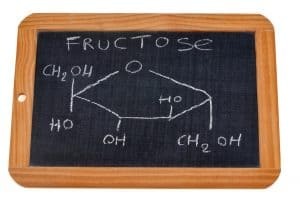 Fructose, or fruit sugar, is a simple six-carbon sugar or monosaccharide. It is commonly found in small amounts in plants and fruits, but it is also added to many foods including said to improve taste and increase sweetness. In sucrose, it is found bonded to a glucose molecule (another six-carbon sugar). It is quite harmless in small amounts, but large amounts like that found in high fructose corn syrup are been tied to obesity, diabetes, and heart disease. For this reason, it has been the focus of multiple research studies. If fructose works to increase obesity in babies and pass through the placenta and into the breast milk, this could be of grave concern and a potential cause for future obesity. One recent study looked at the question of fructose and breastmilk. This study included twenty-five mothers and infants that received care in the Oklahoma Health Sciences Center. The subjects were followed and data was collected at 1 and six months of infant age. The infants were exclusively breastfed for six months, so that was the only source of sustenance. The beast milk was tested, and sugars composition in breast milk was measured. The researchers also looked at infant body composition by using dual-energy X-ray absorptiometry. Fructose, glucose, and lactose were present in breast milk and stable across visits with means of 6.7 μg/mL, 255.2 μg/mL, and 7.6 g/dL respectively. Despite its very low concentration, fructose was the only sugar significantly associated with infant body composition. A 1-μg/mL higher breast milk fructose was associated with a 257 g increase in body weight with a 131 g increase in body fat mass. The bottom line: Fructose passes from the mother to the newborn baby through breastfeeding. Fructose is also associated higher levels of body mass to include body fat at six months of age. This is especially concerning because fructose has been directly tied to obesity. This study shows that fructose, and the small amounts that pass from mom to baby, increases the risk of obesity in the off in the offspring. More research is needed, but this may indicate a need for warnings on fructose-containing products for mothers who are breastfeeding. Myth: The grapefruit diet will jump-start your diet. Be the first to comment on "Research: Fructose can be passed through breast milk and increase BMI. "